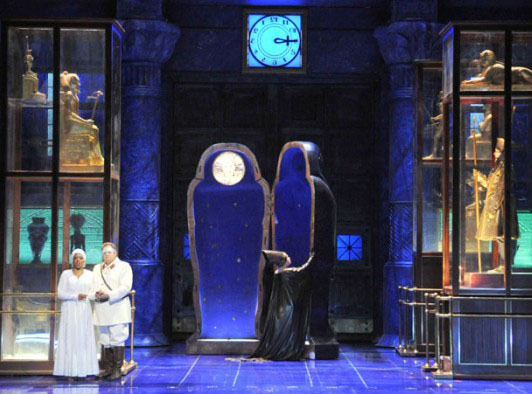 Aida and Radamès in the Staatsoper performance of Aida. Image courtesy of the Staatsoper. I went to the opera with M on Saturday night. My job, it seems, was to stay awake. Jetlag from my recent trip to Australia sent me to bed most nights before 8 p.m. for the past week, and every night I’d try to stay up just a little later, working my way toward Saturday’s three-hour performance of Aida at the Staatsoper im Schiller Theater. He likes an informed audience; he’d appreciate an informed date by his side, one who knows better than to talk through the orchestral opening to the third Act, and I did, unlike a few louts around us, at whom he fired a sharp, silencing hiss. He reminds me—and others—that opera isn’t just when someone is singing. He wanted to give his full attention to the sounds of the orchestra hidden away in the pit, the foreign chirps and buzzes meant to evoke an idea of Egypt, a passage he’d played for me in our living room when my eyes had been closing with fatigue. This was M’s weekend; Sunday was his birthday. He played Beethoven for a small audience on Friday night, a long-promised gift to thank our friend Hanna for helping us secure our family’s visas. He played from memory, his eyes closed most of the time, lost in the reverie of the sonata and somehow able to ignore his audience of four: me, Hanna, and a lovely retired couple she wanted us to meet. M was engrossed except when he landed on a wrong note or missed a transition, and a brief look of annoyance would cross his brow, and then he’d find it again, the right notes, the way back into the music, the way to shut us out. He said a few words about the piece before he played, and that’s the part I love as much as or maybe even more than the music itself. I feel an odd pride when he does this, whether he speaks before a small group as he did on Friday or before a crowded hall when he’s in St. Paul. I can’t believe this knowledgeable, endlessly interesting, humorous, self-deprecating, handsome performer is the same man I live with, whose sharp intake of breath at finding the coffee pot unwashed can drain my good humor in an instant. I have trouble reconciling the two. Saturday night was Aida, our next opera date, and I felt very prepared, though M thought I still hadn’t learned nearly enough; we never managed to listen to even a moment of Act II. Not that it mattered to him. “Lately I’ve been listening to this when I jog,” he said, to which I replied, “I can’t imagine ever choosing to exercise to Aida even once in my lifetime,” and he laughed, as I knew he would. I can’t pretend to be an opera fan or aficionado. As much as I’d like to be the worthy partner of the man on the stage, the one who can stand before an audience and tell stories and then sit and whip off a bit of music on the piano and then return to amuse us all again from the microphone, I can’t. I recall after his lecture on his book on Shostakovich that I fell in love with that man on the stage, only to find that offstage it was just him again, and I was just me, and that man on the stage was nowhere to be found. The things we argued about were still there; the little frustrations hadn’t evaporated at all. And yet he held this magical power that he could wield if he chose. Sometimes I worry he’s a bit too much like Verdi; he insists he doesn’t believe in happiness. But I do; I think there is joy to be found in the here and now, and I think, though he denies it, that some part of him believes it too. After the opera we went out to Don Giovanni, a restaurant halfway between the Schiller Theater (temporary home of the Staatsoper) and the Deutsche Oper, filled with instruments and small tables and warm wood. It was lovely. When we were almost finished our wine, in came Amonasro in street clothes, the singer who had played Aida’s father, and M recognized him right away. “Bravo!” said M as he walked past our table, and the large man turned and acknowledged us with a smile and said, “Thank you so much,” and M beamed like a kid on Christmas Day. “He has these crazy white eyes. I’ve noticed them on Met Player,” M said, recalling the many scenes he’s watched featuring this man who was now a few tables away, ordering a beer. He was starstruck in a way I’d never seen, as thrilled as our oldest daughter was after she met Jennifer Lawrence at a red-carpet launch of Catching Fire in Potsdamer Platz. A little while later two women came in and I was the one who recognized that one of them was Amneris, one of the female leads. She had actually gotten more applause than Aida herself. And M kicked himself for not saying Brava to her as she walked by, not trusting that it was her. I encouraged him to go over to their table but he wouldn’t do it. I hoped when I came back from the basement to gather my coat that he would have taken the opportunity to approach them but he hadn’t. As far as I can tell, one of the best moments he’s had in Berlin was when he was walking in alone to take his seat for a performance of one of the more obscure Verdi operas, and a woman walking in beside him asked him in English, “Do you know anything about this opera?” And of course he did; he probably knew more about it than most of the singers who were about to perform, immersed as he is this year in Verdi. And he started telling her what he knew, no doubt more than she’d bargained for. He reads so much about Verdi’s operas that he knows odd little stories about various performances, and he shares some of them when they occur to him. He told me to listen for the last note of Radamès’ first aria, to see how he sings that final high note. It’s written to be piano but it’s almost impossible for a tenor to reach that high note without belting it out. And a serious audience will boo you if you sing it too loud. He said that in Italy, whistling is their form of booing. He told me about a singer who performed Radamès at La Scala who didn’t realize that there are some disruptive Italian opera fans who sit in the back and always whistle at everything, so when he hit that high note and then heard through the applause the distinct sound of whistling, he made an obscene gesture to the audience, walked offstage and hailed a cab, leaving his stunned understudy to take his place. Afterwards I told M that I liked the final scene when Aida and Radamès climb willingly into their tomb where they know they’ll be buried alive. I said I liked how they both accepted a death of their own choosing, rather than living a life apart. And M said that’s Verdi for you; death beats life every time. “Are you living your death to the fullest?” M sometimes asks his students, startling them, I’m sure. M is more like Verdi than I’d like to admit. I’m told that Verdi would not think much of our modern pursuit of happiness, our stubborn insistence that it’s around here somewhere. M has no interest in the empty pursuit of nonexistent emotions, but he has a wife who thinks happiness is surely out there. Yet he can fawn over an opera star, the brush of fame putting a glow in his cheek. I see that he is just as susceptible to the charms of this world as I am, but I don’t think I’ll do him the indignity of telling him so. This entry was posted in Music - Opera and piano and tagged Aida, Beethoven, Berlin, Deutsche Oper, Don Giovanni, Egypt, Radames, Shostakovich, Staatsoper im Schiller Theater, Verdi on February 24, 2014 by Jill M..
Kristen Please forgive iPhone brevity! So glad you liked it, Kristen! The opera house is a wonderful place to be. Thanks, Hanna. I wanted to fit in how much I enjoyed your playing too, but this ended up being a piece about M.
Hi Jill, M here.Thanks for staying awake! And for honoring me on your blog. Or is it humiliating me? I hope we can meet some more opera stars together before we leave Berlin. Next time, I’ll remember to say something like “And your line ‘you are not my daughter, you are the slave of the Pharoahs’ was the best singing of the whole night,” as I should have said to George Gagnidze on Saturday night. M in a nutshell, or blogpost. He’s also the one who cries at the end of Cinema Paradiso, so he’s not made of stone.